Paint Zoom is a paint sprayer that claims you can paint, stain and varnish just like a professional. 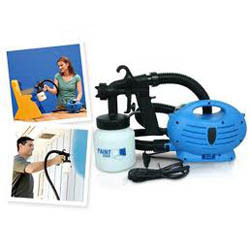 Paint Zoom is very similar to the Best selling Wagner 518080 Control Spray Max HVLP Sprayer . The Paint Zoom is equipped with a 650 Watt motor. The spray works through a one tough system and is ultra light and portable. Paint Zoom is currently available at Amazon. With your help we can reach more people and let them know about Paint Zoom whether this product works or not.